Sponsored by The Flower Bowl at Barton Grange, this award is made to the person who has given up their free time to volunteer in sport. Sport in Britain depends on volunteers and these people will be the backbone of sporting opportunities. 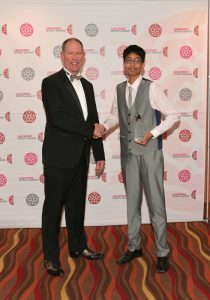 The winner of the Volunteer of the Year Award was Vishal Karri. Vishal is a volunteer football coach with Fishwick Rangers Tiny Tots FC who has dedicated over 200 hours of his time to volunteering. Vishal coaches regularly at the weekend, helping young people aged 4-8 from across the city to improve their football skills with the Tiny Tots scheme. Vishal carries out a variety of administrative duties for the club including designing all the flyers & the posters promoting the club’s weekly sessions.